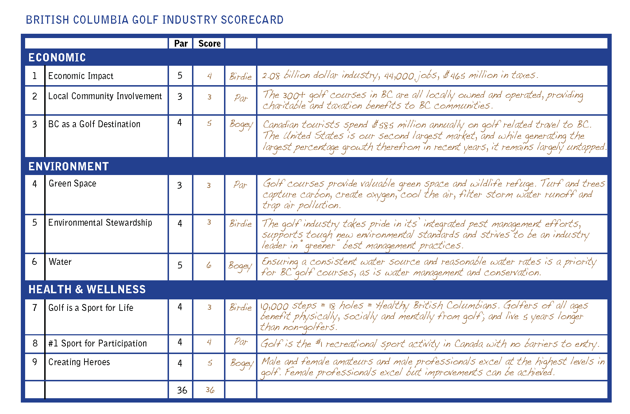 Performance of the British Columbia Golf Industry in 2015-2016 is summarized in our nine-hole British Columbia Golf Industry Scorecard, including economic impact, environmental and health& wellness benefits. Golf is big business in British Columbia contributing $2.08 Billion in economic impact, employing 44,000 British Columbians, and contributing $465 Million in taxes. We have asked government to join us for the back nine toward improving our bogey holes and assist us with growing the game through both player development and golf tourism.